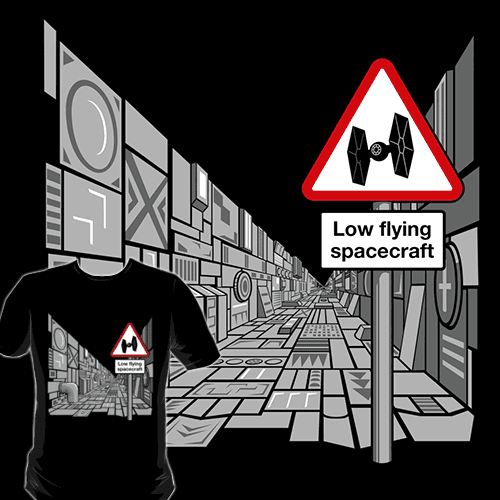 Low Flying Spacecraft will be printing on Teeraiders.com from December 26th through to December 28th. You know all that cash you got in your Christmas cards? Well now you'll have something cool to spend it on! Tee Raiders sell one design for 72 hours at $10 a shirt. They also sell hoodies from $30 if you want to keep a bit warmer during these cold winter months. Everyone needs a Star Wars shirt, so if you didn't get one as a present, this is the time to treat yourself. The Death Star is a dangerous place no doubt about that. But there’s no reason that it has to stay that way. So now that the imperial fleet safety review team has finished their review, we will be installing these signs and many others in all the dangerous areas that were identified. Remember, safety at work is everyone’s responsibility! Also available on Redbubble for only £15.99 just in case you are either impatient or too late.